Wim Delvoye has spent much of his illustrious art career transforming unused objects into incredible works of art. 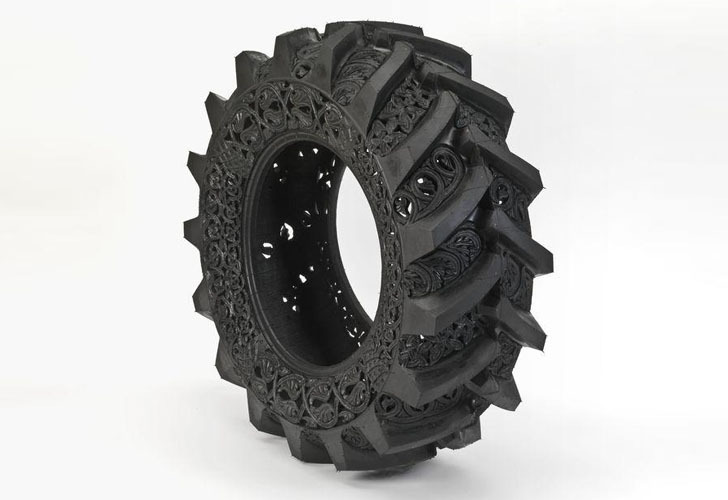 In his series, “Pneu” (French for tire) the artist carves intricate patterns into disused tires of different widths and textures. 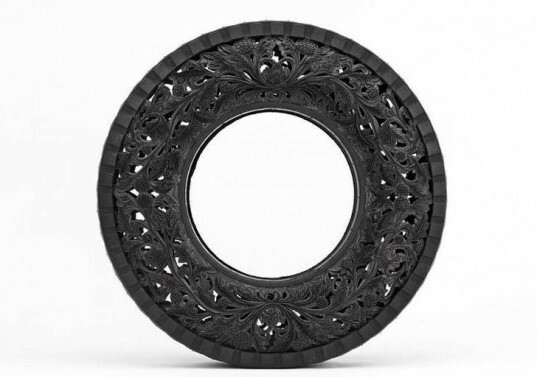 The resulting pieces come alive with floral and organic motifs which are cut into each tire’s surface. The Belgian artist manipulates found objects with painstaking hand carving, or by burning the materials with a soldering iron. The tires used range in thickness, texture and diameter, based on their former use. Delvoye’s designs are reminiscent of popular patterns and motifs found in the history of decorative objects. Elements from Art Nouveau are recognizable in his carvings of flowers, scrolls, leaves and grapes. Carefully sculpting the rubber of each tire, Delvoye removes gradated sections of the material’s surface, creating an incredible series of decorative reliefs. The tires still resemble their original circular shape, however they take on the appearance of cast metal or carved wood. The bendable rubber appears sold and strong, however Delvoye’s lacy transformations give the material a shine that suggests it is made from a sturdier, more solid material. Delvoye’s tires have an altogether different value than their original utilitarian forms. His also employs his subtractive practice upon metal by turning dumpsters, scrap CorTen steel, and even whole dump trucks and tractor trailers into giant, beautifully detailed lace-like shells. The Belgian artist manipulates found objects with painstaking hand carving, or by burning the materials with a soldering iron. The tires used range in thickness, texture and diameter, based on their former use. Delvoye’s designs are reminiscent of popular patterns and motifs found in the history of decorative objects. Elements from Art Nouveau are recognizable in his carvings of flowers, scrolls, leaves and grapes. Carefully sculpting the rubber of each tire, Delvoye removes gradated sections of the material's surface, creating an incredible series of decorative reliefs. The tires still resemble their original circular shape, however they take on the appearance of cast metal or carved wood. The bendable rubber appears sold and strong, however Delvoye’s lacey transformations give the material a shine that suggests it is made from a sturdier, more solid material. Delvoye’s tires have an altogether different value than their original utilitarian forms. His also employs his subtractive practice upon metal by turning dumpsters, scrap CorTen steel, and even whole dump trucks and tractor trailers into giant, beautifully detailed lace-like shells.